Delta EFB0412VHD-F00 - Computer, cooling, hardware & accessories with discounts direct to you. Sorry, we are currently sold out of Delta EFB0412VHD-F00. BRAND NEW Delta EFB0412VHD-F00, 12 volt, 40x20mm fans. These come with three 12" bare lead wires, the third wire being the TACHOMETER FUNCTION for fan speed monitoring. Direct replacement for many fans found in HP Workstations, DELL Switches and CISCO Routes. Hard to find Delta fans for our network switches, delivered fast and WITH the correct connector. 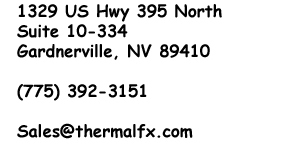 We're very satisfied with the quality of service from ThermalFX.